Paid advertising using Google AdWords is no different. Google wants to serve up the most relevant search results. Now I get that Google is about making money, so if you want to just waste money and bid higher than anyone else, ignoring best practices, you can make it to the top and get clicks. If, however, you want to use your ad spend wisely and get the best results for the least spend, you need to follow best practices. The more closely tied together these 3 components are, the better performance you’ll get out of your spend. There are so many businesses that come close in achieving this, but just miss the mark. For example, I’ve seen businesses that will do ok with #1 and #2, creating tightly themed ad groups and ads based on well thought out keyword themes, but then completely fail on #3 and create landing pages that are unoptimized and generic, not closely related to the keywords and ad copy. Then there are businesses that just completely miss the mark on all 3. This is such a common problem that you don’t have to work very hard to find it. In writing this post, I literally found an example of this with the first search I came up with off the top of my head. The example is in the legal vertical. 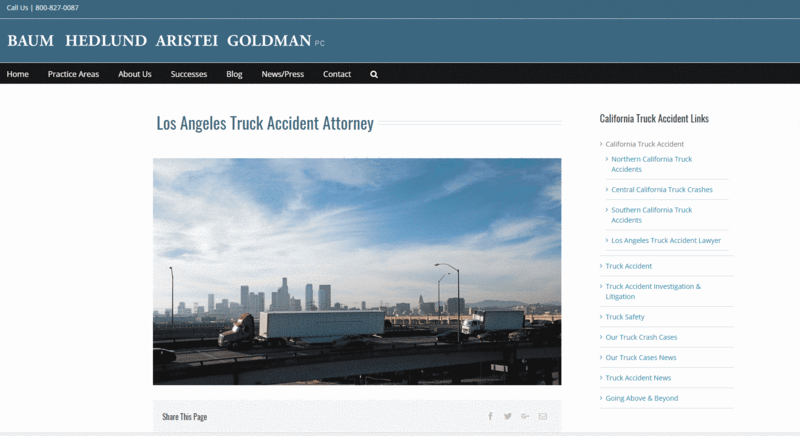 I did a search for “motorcycle accident attorney los angeles” (I grew up in the Los Angeles area). 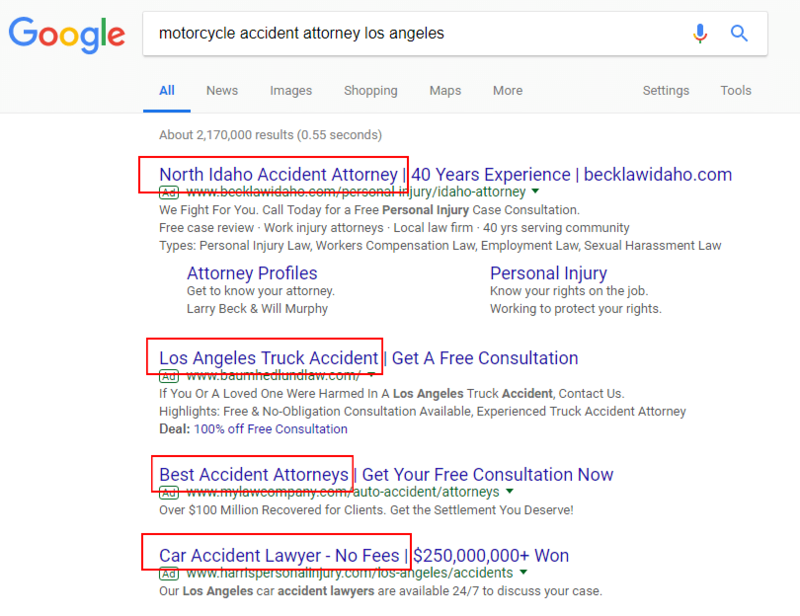 In the results you will see that there are 4 ads and that a main part of my query, “motorcycle accident attorney” isn’t in any of the ads. Not even the word “motorcycle” shows up. 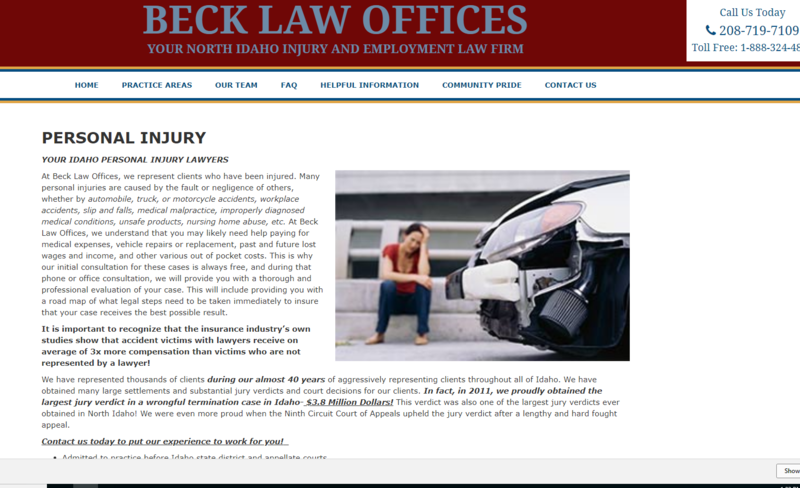 You can also see that since I’m in North Idaho the very first result that was returned is from BeckLaw.com with the headline “North Idaho Accident Attorney.” WHAT? If I’m specifically looking for a Los Angeles attorney, although located in Idaho, chances are pretty good that is what I want! This firm is most likely wasting money with their settings configured in this way, not to mention the ad says nothing about motorcycle accidents. At least it isn’t about “trucks” or “cars” like some of the other ads in the example. Most searchers are intelligent enough to understand that although none of these ads area specifically about “motorcycle accident attorneys,” all of these injury firms probably handle those types of cases. Still, most consumers are very impatient and “want what they want when they want it!” Looking at the results in this example, there is a pretty good chance I might just do another search to get more specific results. Either way, these firms are likely wasting money in their advertising, paying more for clicks, getting lower clickthrough rates and conversions. Let’s turn to a good example. Letting my impatient consumer be my guide, I did another search using a slightly different keyword. This time I used “motorcycle accident lawyer los angeles” with the only difference being “lawyer” instead of “attorney.” A little better. The Dominguez Firm, was at least in the wheelhouse. They have a pretty decent headline, relevant to my search. The have the word “motorcycle” in the display URL, although they used attorneys instead of “lawyers” but we’ll still give them a decent grade. They also have “motorcycle accident attorneys” in the description, it never hurts to stick with the same words in the description, so I would use “lawyers” again here. They’ve got their phone number displayed and generally this is much better than the previous example. It still needs some tightening up, but hey we’ll give them an initial B- grade and then we’ll bump it to a B because they are using structured snippet extensions. Nice! Those could be refined a bit, but again these guys are doing a far better job than their competitors with relevance. Because users make split second decisions this landing page runs the risk of losing the visitor as they bounce back to the search results to look for something else. All of the landing pages in my examples were low quality. These pages are likely missing out on conversions they could have if they were more effective and relevant to the ads that point to them. Again, most consumers aren’t stupid and can figure out you can handle motorcycle cases, but you don’t want to take the risk of making them have to think too much. Not only is the Beck Law Firm most likely losing conversions, they are probably paying more for clicks with lower quality scores. They really should give me a call so I can help them out! They do get a small bonus for using promotion extensions, but the text in the extension is redundant. It seems they are offering “100% Off Free Consultation.” Like the others this ad and landing page misses the mark for the original search query and you can also see that the landing page is wasting precious “above the fold” space. Next was Movgar & Yamin. Again, nothing about a specialization in motorcycle accidents. At least the landing page is a little better and has some important things above the fold. 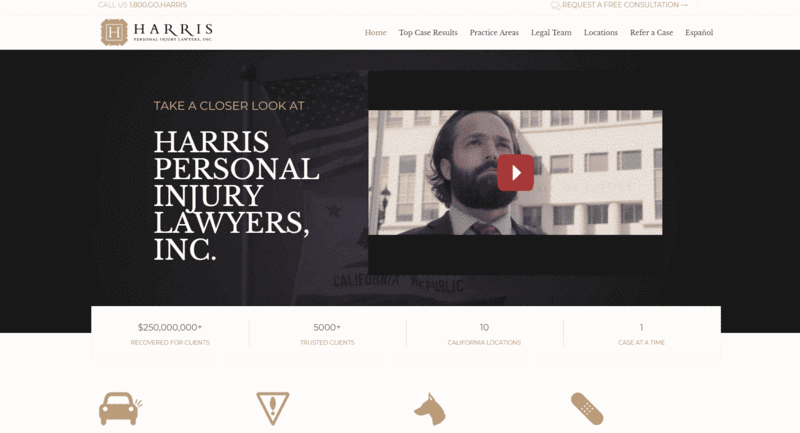 The last of the ads from the 4 in our original search was from Harris Personal Injury Firm. Their ad was about car accidents, not motorcycle accidents, but it should have least been consistent and led to a car accident landing page. Instead the ad just led to their home page, which is fine for a branded ad, but not great for an ad about a specific practice area. If all of the firms in these examples would just remember to string relevance through keywords, ad copy, and landing pages, they could create a far better experience based on what expectation the searcher has. 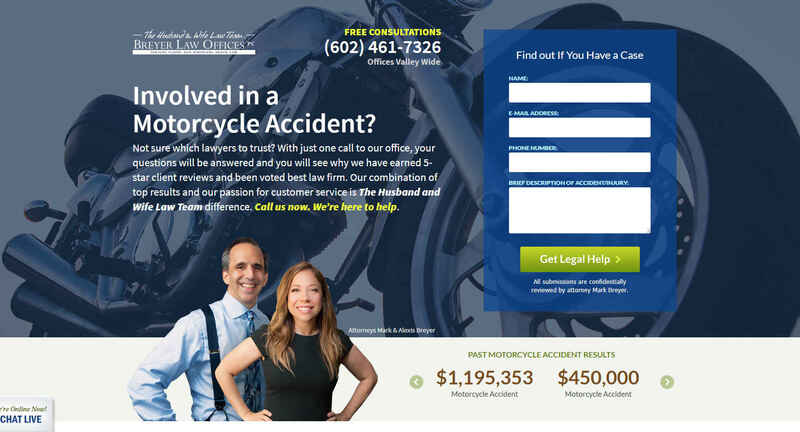 If you are putting ads out there to show your expertise in handling motorcycle accident cases then be sure that’s what your ad and landing page talks about! This is pretty simple stuff, but SO MANY businesses, including major corporations, don’t take the time to get organized and group themes together in this way. This is such a basic concept, I’m just not sure why more businesses don’t get it. Make sure your KEYWORDS are relevant to your AD COPY and that both your keywords and ad copy are relevant to your LANDING PAGE! Here is a pretty good example. It took me a little longer to find it, but the Breyer Law Offices did a much better job than the others. They made use of multiple extensions. This firm did a much better job with relevance. From my original query to their ad to their landing page, they have kept with the same theme. The landing page is good quality, has a background image with a motorcycle, has at least part of the keyword in the title, shows some case results that are specific to motorcycle accidents. This is the idea! They could tighten things up a bit all the way through, but this is a pretty good example. Again, this is a very simple concept, but extremely powerful. Remember, don’t make people have to work to hard and give them what they are expecting based on their search query. 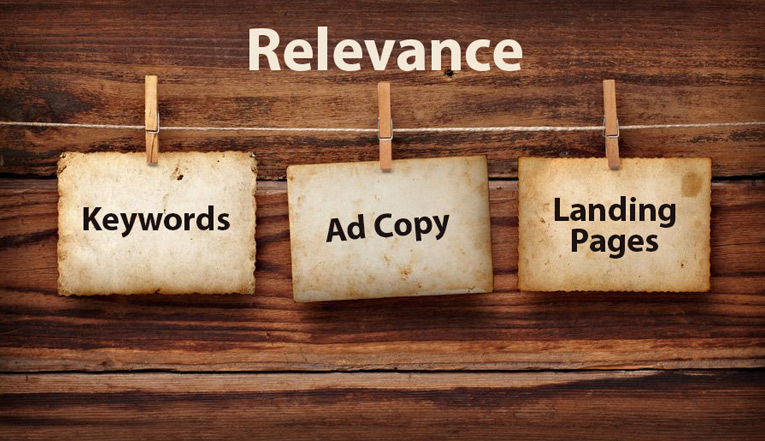 Keep relevance as a thread through your keyword, ad copy, and landing page with a foundation of high quality and you will be on your way to getting better performance for less money! Feel free to reach out to me if you have any questions about these concepts. Since 2005 I have helped small businesses and large corporations maximize their revenue with strategies that stand the test of time. Many companies don't have a solid understanding of how to succeed online, but I do. Let me show you how.